feel younger. The increase in cosmetic treatments and procedures makes it easier to slow down the ageing process. Letitia Herold takes a look. Ageing and sun damage have a major effect on our skin. 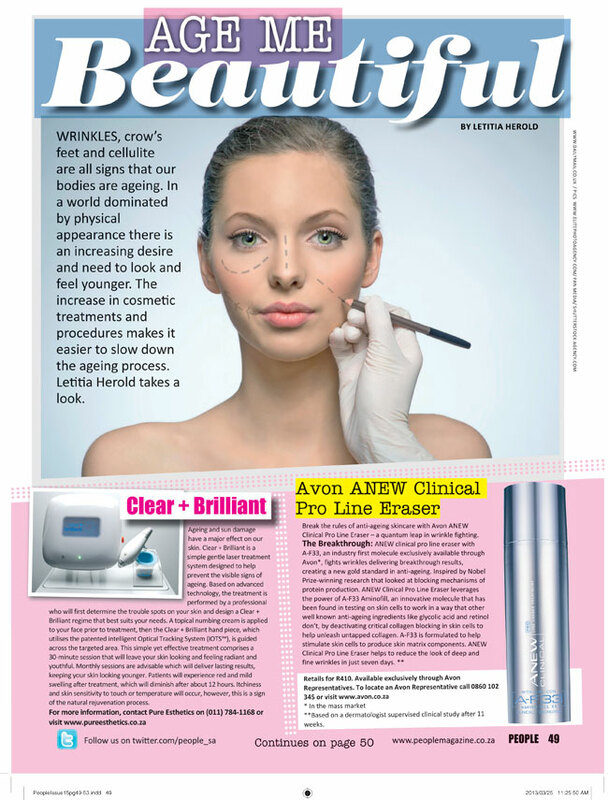 Clear + Brilliant is a simple gentle laser treatment system designed to help prevent the visible signs of ageing. Based on advanced technology, the treatment is performed by a professional who will first determine the trouble spots on your skin and design a Clear + Brilliant regime that best suits your needs. A topical numbing cream is applied to your face prior to treatment, then the Clear + Brilliant hand piece, which utilises the patented intelligent Optical Tracking System (IOTS™), is guided across the targeted area. This simple yet effective treatment comprises a 30-minute session that will leave your skin looking and feeling radiant and youthful. Monthly sessions are advisable which will deliver lasting results, keeping your skin looking younger. Patients will experience red and mild swelling after treatment, which will diminish after about 12 hours. Itchiness and skin sensitivity to touch or temperature will occur, however, this is a sign of the natural rejuvenation process.